The recipe for this cookie comes from Farm Journal Christmas Cookbook, which I bought in 1973, before any of my four children were born!! It happens to be THE favorite cookie of my three sons. It is also embarrassingly simple how easy this cookie is. I hope you can try this delicious tasting cookie from one of my favorite cookbooks. Combine cake mix, eggs, water and shortening. Mix with a spoon until well blended (I actually use my mixer for this part). Shape dough into balls the size of small walnuts. Roll balls in confectioners sugar (coat liberally). Place on greased baking sheets. Bake in a 375 degree oven for 8-10 minutes. I received this recipe from a co-worker long ago & it quickly became a family favorite! It's so easy to put together & impressive to serve. As an appetizer, you can serve it with a light wine & seedless grapes. Heat oven to 350 degrees. Cut cheese in half horizontally to form two circles; remove wax. Separate dough into 4 rectangles. Firmly press perforations to seal. Place one rectangle on top of second; repeat with remaining rectangles, making two double-thick rectangles. Press each into a 6-inch square; place cheese circle in center of dough. Pull corners of dough to top of center of cheese. Press dough tightly against cheese. Twist dough in center to seal, twisting off excess dough. Press seams to seal. Repeat to make second Gouda wrap. If desired, press out excess dough. With canape cutter or paring knife, cut out decorative shapes; place on top of each Gouda wrap. Brush with beaten egg. Place 3" apart on ungreased cookie sheet. Bake ate 350 for 18-22 minutes or until golden brown. Cool 10 minutes before serving. Cut into wedges to serve. Coat the top of each Gouda cheese with 2 t. of apricot preserves & top with the dough. Bake as directed, omitting the egg wash. After baking, coat the top of the baked Gouda with 1 T. honey & sprinkle with 1 T. toasted, sliced almonds. This serves 8 as an appetizer or 4-6 as a snack. If I had to pick a favorite cookie, this one would be one of my top picks. I started making this when I was a Girl Scout. Of course, all the rage now is salt on top of cookies. Who knew that this cookie was fashionable before it's time, because it has salty nuts in it?!! This recipe also makes adorable nests for Easter time. This is a great, easy, no-bake recipe. I personally like the butterscotch/chocolate combo, but you may like peanut butter/chocolate. Melt the chips together in a microwave-safe bowl. I do this on 50% power at 1 minute intervals, stirring in between. When melted, add the Chow Mein noodles & the peanuts and stir until everything is coated. Drop the cookies by spoonsful onto cookie sheets that have been covered with wax paper. Chill in fridge until firm & then transfer to covered containers. YUM!!! I got this recipe from a Southern Living magazine and have been making it during the holidays for many, many years. It is so good, easy & really pretty. You can make one large pinecone or 2 smaller ones. Some of our grandkids love it, too, so I make one for them. Here's this wonderful recipe. Stir together 4 ingredients. Shape into an oval; chill 2 hours. 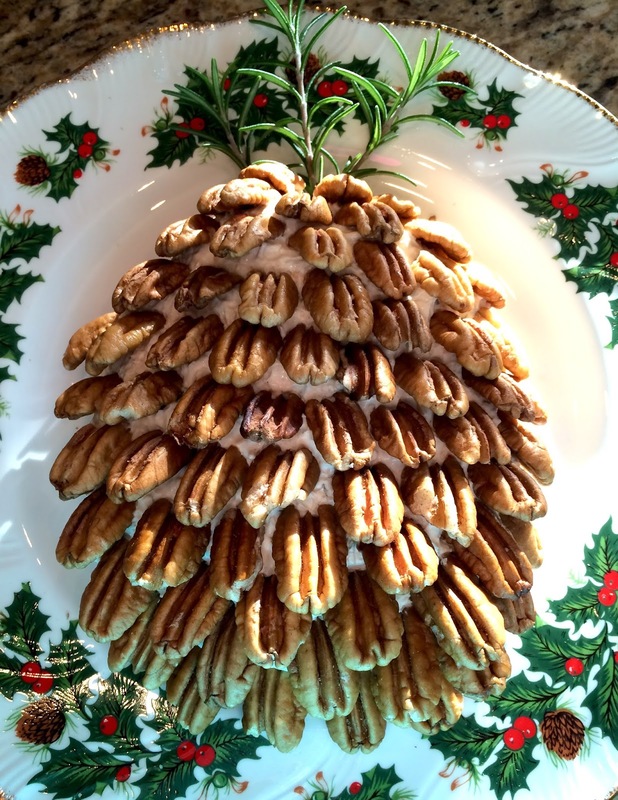 Arrange pecan halves over cheese oval in overlapping rows beginning at the bottom & working upward. Arrange rosemary sprigs at top of pinecone. Serve with crackers. I first saw these at a friend's blog http://divinepartyconcepts.com/2011/12/05/santa-treats/ & then again at http://mountainbreaths.blogspot.com/2011/12/santa-hat-brownie-bites.html. I wanted to try them for a luncheon I was attending, but did them a super quick & easy way. You could use a buttercream or a cream cheese frosting in place of the aerosol whipped cream, but those watching their sugar intake appreciate the whipped cream!! The only problem with the aerosol whipped cream is that you need to do this right before serving, as it starts to dissolve when sitting. Mix up the brownies according to directions on pouch. Spoon batter into 24 miniature muffin cups (you could also spread batter into prepared pan & then cut the round shape with a small glass). Bake the brownies according to directions. Mine baked in about 15 minutes. Let cool a few minutes in pan & then carefully remove from muffin tin. Let cool completely. Pipe a circle around the brownie. Place strawberry on top, stem side down. Pipe a dab of whipped cream on top for Santa's hat. I still have mint growing in a pot! I usually only make this once a year because it is TOO GOOD! The recipe is from Tyler Florence & it is simply divine. Even though it is rich & sinful, you can make small servings & still get the pleasure of enjoying it! If you've never made creme brulee, it is really quite easy. I hope you try this (my adapations are in red) fabulous recipe!! Preheat oven to 325 degrees F. In a large bowl, cream together egg yolks and sugar with a whisk until the mixture is pale yellow and thick. Pour cream into a medium saucepan over low heat. Using a paring knife, split the vanilla bean down the middle, scrape out the seeds and add them to saucepan. Bring cream to a brief simmer, do not boil or it will overflow. Remove from heat and temper the yolks by gradually whisking the hot vanilla cream into yolk and sugar mixture. Do not add hot cream too quickly or the eggs will cook. Divide custard into ramekins, about 3/4 full. (Somehow, Tyler Florence uses 6 ramekins, but ( I get 10-11 servings from this recipe & some of my ramekins are bigger than 6 ounces!). Place ramekins in a roasting pan and fill pan with enough (hot) water to come halfway up the sides of the ramekins. Bake until the creme brulee is set, but still a little wiggly in the center, about 40 minutes. You may want to cover loosely with foil to prevent browning. Remove from oven and cool to room temperature. Transfer the ramekins to the refrigerator and chill for 2 hours (I even make them a day ahead & chill in the fridge.) Sprinkle 1 tablespoon of sugar on top of each chilled custard (brown sugar is yummy, too!) Hold a kitchen torch 2 inches above surface to brown the sugar and form a crust. Garnish with fresh fruit & a sprig of mint , if desired. Serve at once. NOTE: You also can put the sugared creme brulees under the broiler & watch very carefully!! I love making spritz cookies!! They are so easy, no rolling involved & you have lots of cookies in a small amount of time. I've tried many spritz recipes over the years, but always come back to this one as my favorite. The touch of orange zest & the hint of cinnamon just make this cookie special. The recipe comes from my very old Mirro cookie pamphlet that came with my old Mirro cookie press, which sadly broke. I do have a new, snazzy one that is very easy to use, but I kind of miss that old aluminum one with the orange top!! My hubby really doesn't much care for spritz cookies because he thinks they're "too bland". However, he loves this recipe. The recipe in the pamphet is called Snowflakes. I hope you give it a try! Cream shortening (or butter), cream cheese & sugar well. Gradually blend in flour, salt & cinnamon which have been sifted together. Fill press. Form cookies on ungreased cookie sheets. Sprinkle with any colored sugar now, before baking. Bake for 10-12 minutes. I only bake for 10 minutes, as I like them that way!!! The original recipe said to bake for 12-15 minutes, but I think that's too long. I made some royal icing, but truthfully, they taste better with just the colored sugar! Before you start, make sure you have clean, sterilized jars & put the lids in a small pan of boiling water. I then keep the lids on simmer, while making the jam & keep hot water in the jars until ready to use. Process cranberries in a food processor with the knife blade until they are coarsely chopped. Combine cranberries, strawberries & sugar in a dutch oven; bring to a boil & cook for 1 minute, stirring occasionally. Remove from heat; add pectin to mixture. Return to a full rolling boil; boil 1 minute, stirring occasionally. Remove from heat & skim off foam with a metal spoon. Quickly pour jam into hot sterilized jars, leaving 1/4" headspace. Wipe jar rims. Cover at once with metal lids, and screw on bands. Process in boiling-water bath for 5 minutes (or see NOTE). NOTE: For a quick way to process the jam, check this recipe here, and follow step #7. It works for me every time!! A scone with this jam & a cup of tea...bliss!!! A rice pilaf & a green veggie would be a nice side dishes! Brown chicken in hot oil. Season with salt & pepper. Place in 9 x 13" dish. Sprinkle with the onion. Combine the sauces & pour over the chicken. Cover with foil & bake at 350 degrees for 1 hour. Remove foil for the last 30 minutes. Check the chicken to make sure the juices run clear. NOTE: I really think this could be prepared in a slow cooker & cooked on low, all day. Mmmm, I love baking during the holidays!! The flavor or cranberry & orange together is especially wonderful. I decided to hunt for a fabulous scone recipe with this combination. I have tried several in the past & they just weren't what I was expecting. I then found Ina Garten's recipe which can be found here & I was in scone heaven!! I cut the recipe in half to make 8 scones, which are LARGE!! **NOTE: If you like sweeter scones, double the sugar. I think the taste is perfect as is. In the bowl of electric mixer fitted with the paddle attachment, mix 2 cups of flour (save the 2 T. for later), sugar, baking powder, slat & orange zest. Add the cold butter & mix on lowest speed until the butter is the size of peas. Combine the eggs & the heavy cream & with the mixer on low speed, slowly pour into the flour & butter mixture. Mix until just blended. The dough will look lumpy. Combine the cranberries with the 2 T. flour, add to the dough & mix on low until blended. Brush the tops with the egg wash & sprinkle with sugar. Bake for 20-25 minutes or until the tops are golden brown. Allow to cool for 15 minutes & then whisk together the confectioners' sugar & orange juice & drizzle over the scones. Be prepared to bite into the most luscious scone !! Sift together the dry ingredients (my trick is to just use a whisk in the bowl & this mixes & aerates the dry ingredients...easy peasy!!). Whisk in the rest of the ingredients. Pour the batter into a greased (or sprayed) donut pan, two-thirds full. You will use half the batter. Save the rest for your next batch. Bake at 425 degrees for 7-9 minutes. Let cool in the pan for a few minutes & then turn the donuts out. Mix powdered sugar & hot water together to get a pourable consistency. Spread on donuts & let the kids decorate with sprinkles. Melt a few chocolate chips in the microwave with a tiny bit of butter. Add this to the leftover powdered sugar glaze for the chocolate lovers. Woo-hoo...I can't wait to make more flavors of donuts. Pick through the beans to remove any small stones & rinse the beans well. Cover with about 8 cups of water in a large stockpot or dutch oven. Bring to a boil & boil for 2 minutes. Remove from heat & cover the pot with a lid. Let sit for 1 hour. Drain the water from the beans. Add fresh water to cover the beans by several inches. Add the onion, celery & ham bone. Bring to a boil & then cover & reduce heat to a simmer. Simmer the ham & beans for 5-6 hours. Remove the ham bone from the pot to cool for a bit & then chop the ham. Remove the large pieces of celery. Meanwhile, smash some of the beans with the back of a spoon to make the soup thick & creamy. Add more water, if necessary, depending on how thick or thin you like your soup. Add the chopped ham back to the pot. Add freshly ground pepper , taste for salt & add if needed. Add the dried parsley & heat through. This makes a lot of soup!! You may want to cut the recipe in half. Here's a great, quick bar recipe. The important thing about this one is don't use a mixer. Just do everything by hand. Here's this delicious recipe to try for the HOLIDAYS !!! Preheat the oven to 350 degrees. Grease a 9-inch-by-12-inch baking pan well with butter. Set the pan aside. Melt the two sticks of butter in a 2-quart microwave-safe bowl covered with a paper towel. Remove the bowl from the microwave, and add the brown sugar. Stir well. Add the baking powder, salt and vanilla extract, stirring until completely incorporated. Stir in the flour, again stirring until it is well mixed. Crack the eggs into a small bowl, and beat them well with a fork or whisk. Add the eggs to the batter and stir with a spoon until they are completely incorporated. Stir in the chocolate chips (and the nuts, if using). Spread the batter in the greased pan. The batter will be stiff and sticky. Bake until the top begins to get golden brown and the blondies just begin to pull away from the sides of the pan, about 20 to 25 minutes. (Baking time will vary depending on your oven and the type of pan.) Do not overbake. Cool for at least 20 minutes, and cut into small squares. Store in an airtight container or cover well with plastic wrap. These bars freeze very well and improve in flavor after the first day. Per blondie: 216 calories (41 percent from fat), 10 g fat (6 g saturated), 38 mg cholesterol, 2 g protein, 31 g carbohydrates, 1 g dietary fiber, 59 mg sodium. This is an adapted recipe from Desperation Dinners. Crush some peppermint candy canes & set aside. Melt your candy melts or whatever chocolate you are using in a microwave-safe container. I like to use a small, narrow juice glass. Microwave your chocolate according to directions on package. I usually microwave at one minute intervals, using 50% power until chocolate is melted. Take your spoon & dip it into the chocolate, coating liberally. Place on a cookie sheet that has been lined with wax paper. Place 3 mini marshmallows down the center of the spoon & sprinkle with the crushed peppermint. You want to do this before the chocolate hardens. Of course, if you don't like peppermint candy, leave it off. Repeat for however many spoons you want to do. This is a fun project to do with kids!!!! Place the spoons in the freezer for about 5 minutes to set the chocolate. Wrap spoon in the plastic wrap & tie with a bow. Give the spoon with directions to: " Add the spoon to hot milk & stir for a delicious hot chocolate drink." I think it would be nice to have a little tag with the title & directions attached to the spoon. If you need a fun buffet for the holidays, I have a WINNER for you!! I first saw this recipe while watching Ten Dollar Dinners on The Food Network. The original recipe can be found here. You could prepare this meal ahead & put the rice, pork carnitas & black beans in one of those triple buffet heating elements. The pico de gallo, sour cream, cheese & green onions could be on the side for garnishing. Even vegetarians would be happy because they could fix their burrito bowl how they enjoy it. I scaled this recipe down for my hubby & I, but I hope to fix this again for my whole family soon! For the pork, I used what I had from this recipe. I had a quart-size bag frozen & thawed that. Toss the tomatoes with the salt. Add the onion & jalapeno & combine. Place the avocado on top & cover with the lime juice to coat the avocado. Sprinkle on the cilantro & stir. Mix all the ingredients together. In a large saute pan, heat 2 T. vegetable oil over high heat. Press the meat into the oil & fry until crusty on one side. In a medium bowl, toss the rice with the cilantro & orange zest. Divide the rice evenly among 4 serving bowl. Top with the black beans & half the pico de gallo. Add warm carnitas & top with the rest of the pico de gallo. Sprinkle on the cheese, add a dollop of sour cream & garnish with green onions. Enjoy this fun, party food! Serves 4. Baked eggs served with toast & cup of tea, what could be better? Butter a small ramekin & then crack an egg carefully into it. Season & then sprinkle the cream or butter on top. Bake in a 325 degree oven for 15-18 minutes. You may want to add some grated cheese the last 5 minutes. Check for desired doneness as the white should be set & the yolk soft. Serve in baking dish. Brown pork chops on both sides in hot oil in a 12" skillet. Sprinkle with salt & pepper to taste. Remove chops to a plate. Melt butter in the same skillet. Stir in flour, 1 1/2 t. salt & 1/4 t. pepper. Add chicken broth & cook, stirring constantly, until mixture comes to a boil. Place potatoes in bottom of 11 x 7 x 1 1/2" baking dish. Top with onion rings. Pour chicken broth mixture evenly over top. Top with pork chops. Cover with foil. NOTE: Since I only make 3 pork chops, I use the same skillet for baking. This saves on clean-up!!! Enjoy a bite of low-cal yumminess!!! Combine pudding mix and milk in a medium bowl; whisk until well blended. Stir in pumpkin, cinnamon & nutmeg. Add whipped topping and mix thoroughly. Serve immediately or cover with plastic wrap and refrigerate up to two days. This dessert would be wonderful for those who are diabetic or watching their sugar intake. Coat a 9 x 13-inch baking dish with cooking spray. Arrange chicken in pan. Top with artichokes & mushrooms. Layer with cheese. Combine the soup & broth. Pour over the chicken. Top with stuffing mix. Drizzle with the butter. Cover pan with foil & bake for 45 minutes, or until chicken is cooked through. Uncover pan for last 5 minutes. NOTE: Cream of chicken or cream of mushroom soup would work in place of the Golden Mushroom soup. Preheat oven to 400 degrees. Arrange shelf slightly below center. Place pork roast in a dutch oven. Sprinkle pork on all sides with the Worcestershire sauce. Press brown sugar on top & sides of the pork. Pour apple juice down the side to the bottom of the dutch oven and not over the meat. Cover tightly. Place in the oven & immediately reduce heat to 200 degrees. Roast for 5 hours without opening the oven. Remove. If meat does not pull apart easily, cover & return to the oven & roast 30 more minutes. Check again, & if meat is still not at the pull apart stage, roast an additional 30 minutes more as needed. Pull meat apart & remove bone. Stir in salt, which is essential for the dish. NOTE: This can also be done in a slow cooker & set on HIGH for 30 minutes, then reduced to LOW for the day or overnight. After I pulled it apart, I separated it into freezer bags to use for several meals. I also strained the juice & put it in the fridge. After it was cold, I took off the top layer of fat. I will be posting about the meals that I make with this. For the first meal, I added some barbecue sauce & a little of the juice from the pork roast to make pulled pork barbecue. I was privileged to receive the Triple Cute Award from two very dear bloggers, Sudha and Pat . I do very much appreciate their thoughtfulness in presenting this award to me. I will be sending this along to seven blogs that I feel have super cute blogs. I hope that they in turn will post about it and pass the award along to seven blogs that they feel are deserving. If you have already received this award, please forgive me! This is an old recipe that I have in my file. If you need a quick gift to bring, maybe you could try this delicious bread. It's really perfect for any season. Those of you that love cinnamon, should really like this. I hope you try it! Heat oven to 350 degrees. Grease & flour bottom only of 9 x 5- inch loaf pan. Lightly spoon flour into cup; level off. In large bowl , combine all bread ingredients & beat for 3 minutes on medium speed of mixer. Pour batter into prepared pan. In small bowl, combine all streusel ingredients until crumbly; sprinkle over batter & swirl lightly to marble. Bake for 45-55 minutes or until a toothpick inserted in center comes out clean. Remove from pan immediately. Cool completely before slicing. Wrap & refrigerate leftover bread. Tips: ** To substitute for buttermilk, use 1 tablespoon vinegar or lemon juice plus milk to measure 1 cup. I also always have on hand powdered buttermilk & you use 4 T. of it with 1 Cup of water. NOTE: I made 4 small loaves to give as gifts (this way, I can keep one, too!!). I baked the small loaves for 30 minutes, but still did the toothpick test. Heat the oil in a dutch oven (or skillet). Season the meat with pepper. Brown the meat on all sides. If using a slow cooker, transfer the meat to that & continue on. Mix the dry onion soup mix, the water or broth & the cream of mushroom soup in a small bowl. Pour over the meat. Add the carrots & potatoes. NOTE: Sometimes I leave out the potatoes & make mashed potatoes or noodles & serve the pot roast over those. A friend told me about this recipe for Mini Pumpkin Butterscotch Muffins. I wanted to try it, but adapted it slightly. I LOVE streusel-topped muffins (isn't that the best part?) and decided to use my favorite streusel recipe from here, only using half the amount. I also thought cinnamon chips would be delicious, so I did half the batter in those & half in the butterscotch to see which I liked better. I also made regular-size muffins. Here's the adapted version! Mix the flour & brown sugar in a small bowl. Add the melted butter & stir. Set this aside for 5 minutes. Using your fingers, break the crumbs into 1/4"-1/2" pieces. Preheat oven to 350 degrees. Grease 18 regular-size muffin cups. Stir together all the dry ingredients into a large bowl. Whisk the eggs, oil & pumpkin in a separate bowl. Mix the flour mixture with the egg mixture. Stir in the butterscotch or cinnamon chips; pour into each of the muffin cups, about 3/4 full. Top with the streusel topping, slightly pressing down. Bake for 15-20 minutes. Mine were done in 18 minutes. Let cool on a wire rack for about 5 minutes, then remove from muffin pan & cool completely on wire rack. If you wait longer than 5 minutes, the muffins tend to stick to the bottom of the pan.